Add the oats, milk, cinnamon, IsoWhey Banana Smoothie protein powder and coconut flakes into a large jar, screw on the lid and shake to combine. Place in the fridge to soak overnight. In the morning, place the oats into small pot or microwave on the stove until warmed through. To make the Berry Compote, add berries and water into a small saucepan and cook on low for 5 minutes, mashing the berries up until you form a puree. You can do this in the microwave if you prefer. Just stop the microwave every 30 seconds to mash the berries. 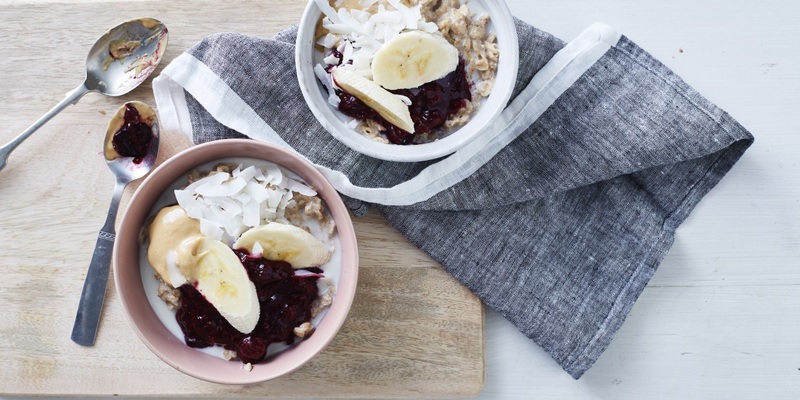 Serve oats with the Berry Compote spooned on top and the coconut flakes and almond butter. Drizzle over a little more milk if you like. Note: You can make this on the day. Just follow step 1 but cook in a small pot until oats are tender.